Tokai Forum - a subsidiary of TokaiRegistry.com :: View topic - CE185T ?? Posted: Fri Dec 30, 2016 7:24 am Post subject: CE185T ?? Hi. New to the forum and was wondering if anyone can give me any info regarding value of a lovely s/h Cats Eyes for sale local to me. I THINK that its a CE185T, although it could be an earlier 1980's model. I didn't get the serial number but it's similar in dimensions to a Martin 000. Lovely thing to play and unmarked condition. It's really won me over, largely for how it sounds, but no idea on the value on these and whether my local (UK) guitar shop is asking over the odds at just shy of £1k. It's just been fitted with an AER mic / piezo system although I haven't tried it amplified yet. If it's in unmarked condition how can it be 36 years old? Are you sure it's not a current CE185T? Here's the current CE185T pricing. 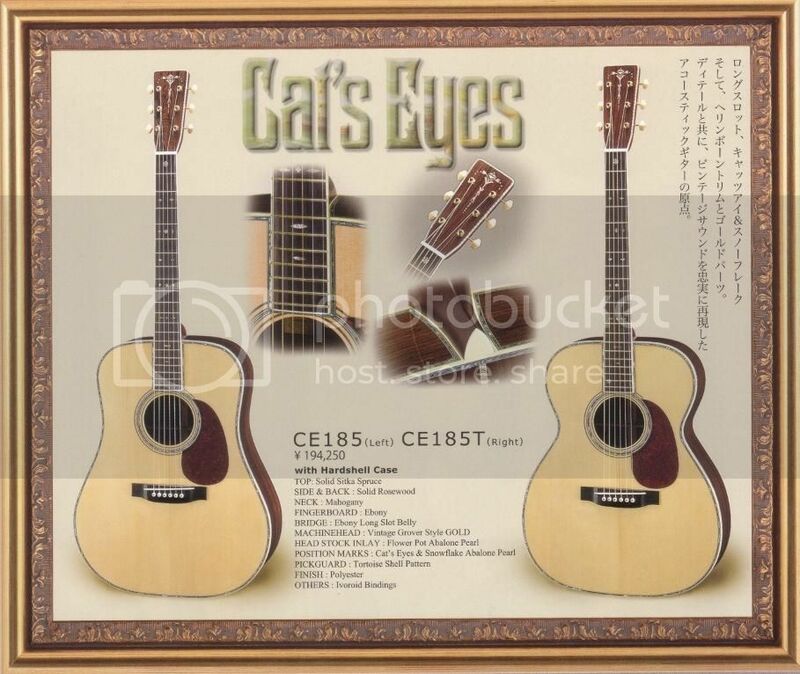 If you have a CE185T it is one hell of a guitar, excellent specs. Thanks for the info. By my reckoning that's about £1400 at today's exchange rates so looks like he's asking about the right money assuming it's fairly recent model. Not that it matters as I should really judge it by how it played and sounded - which was great on both counts. I wasn't trying to suggest it was a 1980's model, just pointing out that they have produced a lot of models that look the same but with different model numbers. Thanks again and I'll let you know if I take the plunge! !